These two amazing releases represent the African American sacred steel tradition, which was first developed in Pentecostal churches by Willie Eason in the 1930s. Though steel guitar originated in Hawaii, the pedal steel has been embraced in the worship at churches in states ranging from Florida to Michigan, where its sound often mimics singing voices and moans, stirring the emotions and fitting perfectly into deep worship. The Lee Boys, a Miami-based funk and gospel band that performs within the sacred steel tradition, recently released their fourth album, Testify. This family group includes three brothers, Alvin Lee (guitar), Derrick Lee and Keith Lee (vocals), and their three nephews, Roosevelt Collier (pedal steel guitar), Alvin Cordy Jr. (bass) and Earl Walker (drums), who all grew up in the House of God church in Perrine, Florida and learned to play various musical instruments. The fact that their father and grandfather, Rev. Robert E. Lee, was the pastor and a steel guitar player at the church must have definitely led them to this tradition. 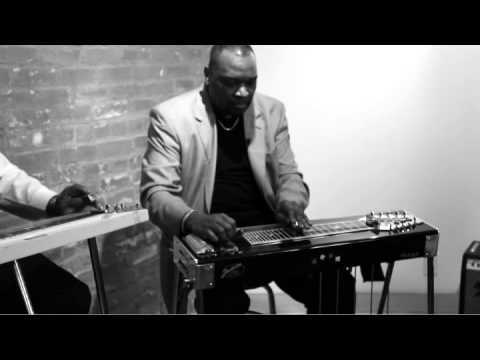 Even though sacred steel is rooted in gospel music, the steel guitar also figures prominently in other genres such as blues, R&B, jazz, rock, and country music. 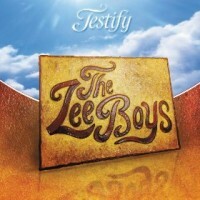 Indeed, Testify is the perfect example of the variety of musical aspects that can be expressed within this musical tradition. You can’t help but dance when you listen to tracks like the title tune, “Testify,” with its funky bass lines. I personally love songs such as “Smile” and “Feel the Music,” which make me enjoy the positive energies that they bring. The band concludes the album with “We Need to Hear from You.” In the first half of the track, vocalists’ free and sincere voices lead you into quiet worship. Then Collier’s steel guitar kicks in the second half, totally changing the worship style into an up-beat rock tune. It is such a clever way to entertain the listeners while keeping the purpose of prayer. 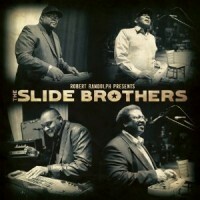 The Slide Brothers consist of steel guitarists Calvin Cooke, Chuck Campbell and Darick Campbell, with drummer Aubrey Ghent. Cooke, who Nashville country steel guitarists have dubbed the “B.B. King of gospel steel guitar,” grew up in Cleveland, Ohio, in a family that went to the Church of the Living God, Jewell Dominion, which had a strong steel guitar tradition. The group’s album was produced by Robert Randolph, one of the most successful pedal steel guitarists and leader of Robert Randolph and the Family Band, who has made it his mission to share the extraordinary talents of the masters of the sacred steel tradition with audiences throughout the world. In order to fully appreciate the differences between these two groups, you can listen to their different interpretations of “Wade in the Water” (The Lee Boys “Wade in the Water” and the Slide Brothers “Wade in the Water”). These performances showcase the steel guitar’s powerful mournful sounds which fit perfectly with the strong message of this traditional spiritual. These new releases are not only a perfect introduction to the sacred steel tradition for those like myself who are not familiar with the genre, but will also be highly prized by those who already appreciate and collect this music. The Lee Boys and the Slide Brothers are certainly destined to become influential steel guitar masters in the music industry now that they’ve expanded their audience beyond the church. This entry was posted in Gospel Music and Spirituals, Rhythm & Blues, Soul, Funk by aaamc. Bookmark the permalink.